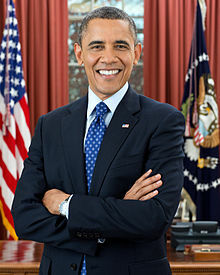 Barack Obama, 44th President of the United States, is the 10th great-grandson of Quaker Edward FitzRandolph, born July 5, 1607, in Sutton-In-Ashfield, Nottinghamshire, England, and his wife, Elizabeth Blossom, born to expatriate English parents in Leiden, Holland, in 1620. Edward and Elizabeth were married in Scituate, Massachusetts, in 1637. After 30 years in the Massachusetts Colony, Edward and his family moved to Piscataway, New Jersey. Edward’s and Elizabeth’s son, Nathaniel (1642-1713), settled in Woodbridge, New Jersey, with his wife, Mary Holley (or Holloway; 1638-1703). 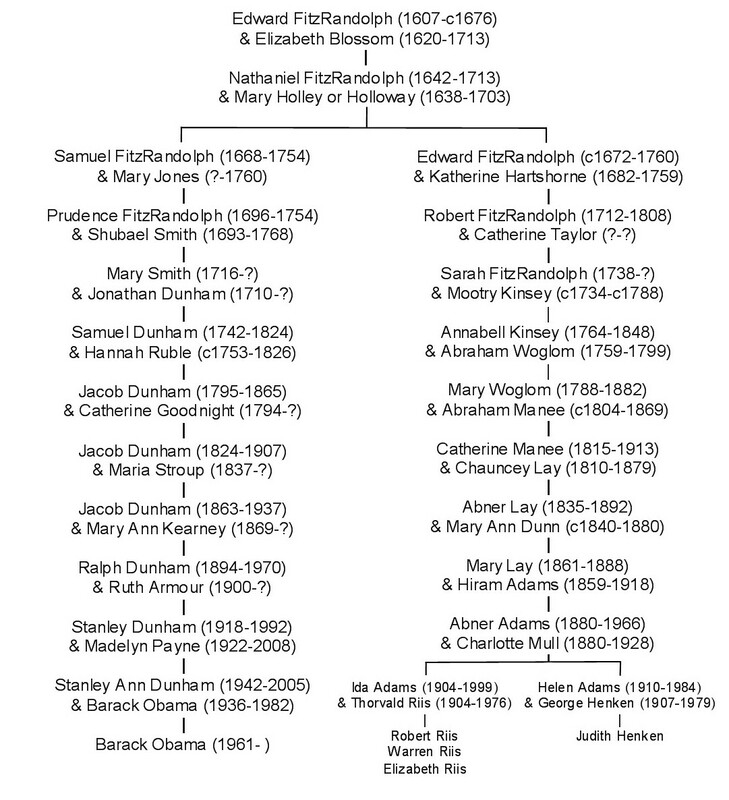 Of Nathaniel’s and Mary’s four children, one, Samuel (1668-1754), is the 8th great-grandfather of Barack Obama, while another, Edward (c1671-1760), is the 8th great-grandfather of Robert, Warren and Elizabeth Riis and Judith Henken. President Obama is 10th cousin to Robert, Warren, Betty and Judy; and 10th cousin once removed to Richard, James, Gary, Lisa, Carl, Jane, Bruce, Cathy, Ron, Stacey, Matt and Sandy. Less closely related, Samuel and Edward’s first cousin, Nathaniel FitzRandolph, was the founder of Princeton University.